In the aftermath of the 1994 Rwandan genocide, with thousands of families decimated, and many Rwandans left to fend for themselves, Janet Nkubana devised a way to help women become self-reliant. Nearly 20 years later, Nkubana is the co-founder and managing director of Gahaya Links, selling handwoven baskets and handmade jewelry overseas to large American retailers such as Macy’s. “We have actually empowered more than 3,000 women in Rwandan communities. These women are no long on the street begging, they can buy their own health insurance, they can pay tuition for their children,” Nkubana said. The Rwandan business owner sat down with VOA during a July stop in the United States where she attended the International Folk Art Market in Santa Fe, New Mexico. Nkubana credits the 2000 passage of the African Growth and Opportunity Act for opening U.S. markets to African entrepreneurs and the government-funded U.S. Africa Development Foundation (USADF) for giving her a grant and training to get her business off the ground more than a decade ago. “They did not give us free money. But they looked at our company, the potential it had and they invested in us. They looked at the infrastructure and invested in a center for the women,” the Gahaya Links co-founder noted. 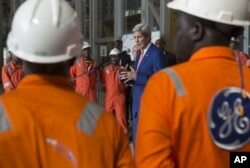 FILE - US Secretary of State John Kerry speaks as he poses with employees of the General Electric (GE) Sonils compound at the Port of Luanda in Luanda, Angola. USADF chairman Jack Leslie says the foundation’s mission is to work with the underserved in Africa, where roughly 50 percent of jobs are created by small business, and women launch some 40 percent of startups. “Africa, to give you a sense, only gets about three percent of foreign direct investment. So, helping these engines of growth and these enterprises that are really creating jobs is incredibly important, and they are good investments,” Leslie said. The USADF chairman told VOA President Obama’s visit and speech at the Global Entrepreneurship Summit in Nairobi this week will bring the world’s attention to a new wave of economic activity in Africa. But it’s not just boosting small African entrepreneurs, USADF is also pairing with large U.S. companies like GE – to help give Africans greater access to electricity. “We are providing $100,000 grants to off-grid energy enterprises. So much of Africa, at least for the foreseeable future, is not going to be part of any electrical grid. So to get power particularly to rural communities, it is going to be through off grid solutions,” Leslie said as he prepared to leave for Nairobi for the summit. GE Africa President and CEO Jay Ireland says Africa offers tremendous potential for investment. The company has put in more than a billion dollars across parts of Africa, including oil and gas equipment manufacturing facilities in Nigeria and Angola and a customer innovation center in South Africa – all tied to the locomotive industry. “The reason we are excited about Africa is that there is a tremendous amount of opportunity and potential. We are an infrastructure company and infrastructure is what Africa needs,” Ireland said. The Nairobi-based executive notes GE’s work in making electricity more accessible both in urban and rural communities are particularly crucial. “[For the] Economic growth of the countries, it’s going to be absolutely critical to have power. And they need that to attract manufacturing, and they need that whether it’s mines or oil rigs or shopping malls – they need electricity. So you are looking at significant deficit of power across the range of countries,” Ireland told VOA. GE and USADF are partnering with locals in Africa to come up with off-grid energy solutions. “I think what gets under-emphasized and misunderstood is the amount of innovative capability there is in Africa. And I think having this Entrepreneurship Summit in Nairobi is great because it highlights all of the advancements and the tools and technologies that have been developed locally from the standpoint of really making life easier,” Ireland said. Janet Nkubana said the spirit of entrepreneurship is alive and well in her native Rwanda, where U.S. investment and training has spurred the Rwandan government to offer vocational programs for young people who are now leading the way in information technology solutions. “If you go to Rwanda today, there are so many young boys and young girls who are not job seekers, but job creators. All of these initiatives – they are creating jobs. When you teach me a skill I will utilize it to make an income and maybe employ another person,” Nkubana said. But for the Gahaya Links co-founder, the greatest impact, she says, is on the families of the women who weave baskets that are sold in department stores across an ocean. “When a woman makes money, a family in Rwanda is doing well because women have proved to be the backbones of their families,” Nkubana said. “Today, we contribute equally. Empowering us, giving us opportunities, you are giving opportunity to the generation of tomorrow.